In early August, TCB-Europe initiated an e-learning campaign for the Dutch travel industry. 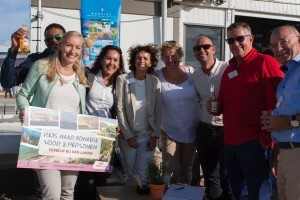 Almost 1000 travel agents participated in the campaign and 6 agents attended the final activity for the travel agents at ‘De Smaak van Bonaire’. Well-known Dutch TV presenter, Jack Spijkerman, held the attention of the crowd until the winning travel agent was announced. Irene Dingjan, Chief Executive Officer of BONHATA, presented the prize to travel agent Froukje Jansen of ‘Reisbureau at Home’. By continuing to promote Bonaire to the travel agent community at large, we are able to educate them and to stimulate and incentivize our trade partners to promote our island to new visitors.